360 Finance Pty Ltd is an Australian company that offers finance and insurance services in Australia only. 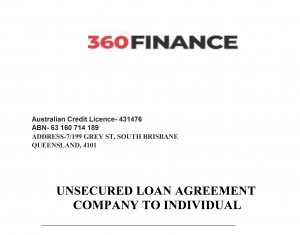 We’ve been made aware of some recent fraudulent emails posing as 360 Finance Pty Ltd by offering or approving loans. The 2 known variations are listed below. This fake email is sent from a Gmail account from a fictitious consultant called Aaron Lord. This consultant(s) does not work for or endorsed 360 Finance Pty Ltd. The subject line of these fake emails is ‘Pre-Approval of Your Loan’ and includes a poor quality PDF document attached and uses an (02) NSW phone number. If you receive this email please ignore or contact our Customer Service Team on 1300 361 360. Below is an images of the FAKE CONTRACT document. These email have they originated out of South Africa with a Gmail contact address.The fraudulent emails, sent from fictitious consultants are offering finance solutions under our company name (360 Finance) and requesting payment of an upfront fee and then additional fees during the process. Both of these emails are scams which are in no way associated with or endorsed by 360 Finance Pty Ltd Australia or our parent company – Automotive Holdings Group. 360 Finance is one of Australia’s largest Finance Broker’s with its head office located in Brisbane. We offer finance solutions to customers living in Australia only and once they have applied directly to us via our website or call to one of our 40+ Finance Specialists.